I had such good intentions. Really, I did. We were staying at a cottage on a bluff overlooking the WA coast, and my sister and I had made a date the night before to go on an early morning beach power walk. Only she got up, and I, well, didn’t. And if the early bird gets the worm, then in this case the early riser gets their own private showing of the beauty and magnificence of God. The tide was out as the first act opened. Translucent jellyfish, some with stark red streaks, dotted the beach. Multitudes of crabs of various sizes scurried across the gray sand. Next up were a couple dozen seals close in to shore, heads bobbing on the water like brown bowling balls (my sister’s description!). One even made eye contact with her before disappearing beneath the surface. The stars of Act Three were the clams, spouting bursts of water from beneath the sand as if choreographed, nature’s version of Vegas’ dancing Bellagio fountains. And the finale? A majestic bald eagle, swooping low, directly over her head, its massive dark wings extended. It circled the beach as she watched and then perched, silhouetted, in a nearby tall tree. I like to call these kinds of experiences “Glimpses of Glory.” They are those times when God’s voice is practically audible, exclaiming through His creation, “I’m here!” He seems to custom design these glimpses with what He knows will most delight a particular child of His. As my sister recounted the incredible display she had witnessed, I was genuinely happy that she had had such memorable moments with her Creator. Ok, and maybe just a tad jealous that I had missed out on the show. But it turned out God had a special surprise planned for me as well, something He knew would thrill my heart. A couple of days later we were enroute to the famous Butchart Gardens in British Columbia, where we looked forward to enjoying High Tea and strolling through the stunning gardens. (Tea is certainly one of my love languages and a stroll is definitely more my speed.) As if that wasn’t enough already, God had yet another treat in store. It caught my eye as we neared the entrance to the gardens. While a vineyard visit wasn’t on our itinerary for the afternoon, it was on His. He knew that, as I had researched and prepared for the class I had recently taught on John 15, I had wished I could visit an actual vineyard. I had never seen one. They must not grow well in this part of the country. And now here was one right beside the very road we were on! It was as if it had been gift wrapped, tied with a ribbon and presented with a bow. Your vineyard, madame. 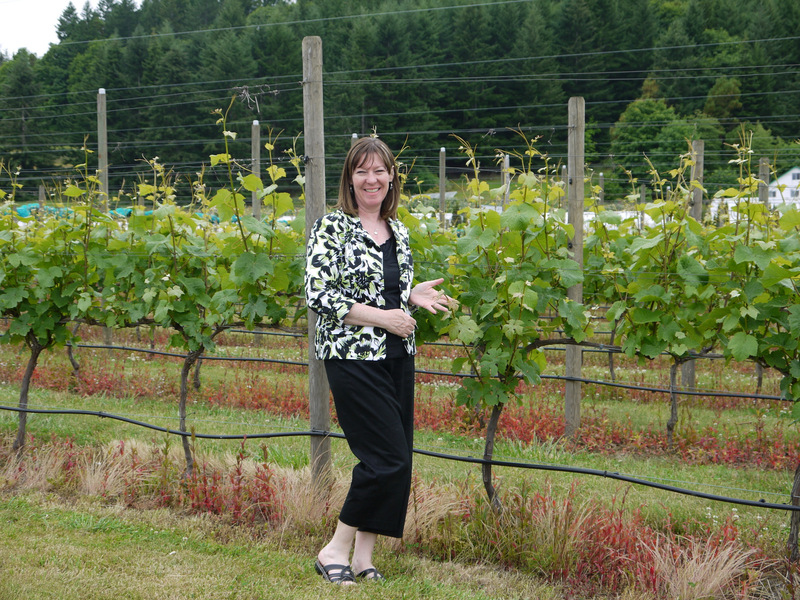 I was almost breathless with excitement when we pulled up alongside the neatly tended rows of grape vines. Like a giddy schoolgirl, I took pictures of the vines on their trellises, observed the leafy branches and the little buds that would someday become fruit. I imagined Jesus as the Vine and myself as the branch, allowing this real life illustration of our intimate connection to sink in. I stood in a vineyard. It was only for a few moments, but I savored every second, delighting in this God who delights in giving His children the desires of their hearts. Thank you Creator God, for these awesome glimpses of Your glory, these sweet snapshots of Your heart.